Fenders are bumpers designed to absorb the kinetic energy of a vessel berthing against a jetty, a quay or another vessel. 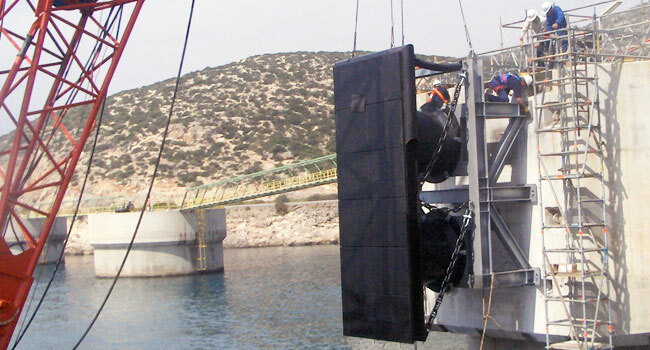 They prevent damages to boats, vessels and berthing structures. Well designed docking fender systems absorb the ship impact at docking, transforming ship´s berthing energies into reactions, transmitting to both, ships and berth structures. There are different types and ranges of fenders, depending on many variables, including dimension and displacement of boats, maximum allowable stand-off, specific berthing structure, tidal variations and other conditions. Prosertek collaborates with port authorities, building companies, contractors, engineering companies, etc, from the initial design and calculations to the turnkey project installation. We design, manufacture, test, install and maintain high end berthing fenders, developed specially for each location, determining what the berthing energy of the range of vessels will be, and calculating what capacity the fender needs to have to absorb the kinetic energy, and finding a way to avoid an excess of hull pressure produced by reaction forces. Our own manufacturing procedure begins with the fender’s design and ends with the installation at the port of destination. This “full process control” ensures strict compliance with international standards for design, manufacturing and testing (British Standard, ASTM, PIANC). Filling cylinders, hydraulic presses, autoclave, etc. Own laboratory for monitoring the physical and mechanical properties of the raw material. Full-scale test press for the final testing of fenders. 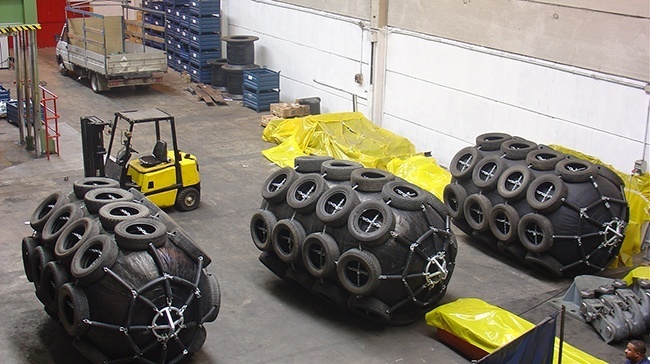 The manufacturing system allows us to offer all types of fenders existing on the market. Regulations, shock absorbing capacity, components, paint and manufacturing material data sheets. Dozens of ports worldwide use our defences. Here are some of our references.